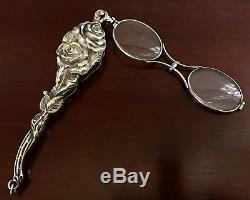 Up for sale is a beautiful, antique sterling silver lorgnette made by fine American silver maker, Unger Bros. 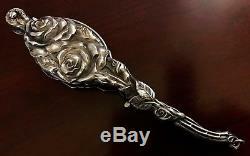 The lorgnette features gorgeous, high relief rose blossoms, and the handle is a stem with leaves! The detail is really phenomenal. There are some condition issues, so please read the description and inspect the pictures. 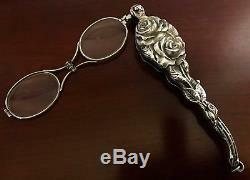 The lorgnette measures 5 1/4" long and 1 1/8" wide. 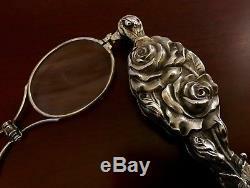 The lorgnette's sterling exterior is in excellent condition with no dings. The glasses themselves have some scratches which canbe seen in the photos. The push button mechanism is intact, but the glasses have to be nudged out of the case. 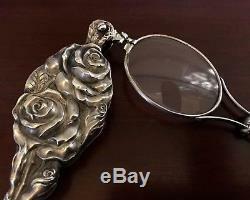 There is a repair where the glasses themselves meet the stelring case. I have shown close ups of the hinge, so the repair can be seen. The glasses are still very beautiful and useable. 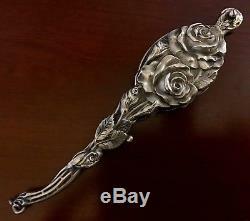 The item "UNGER BROS Sterling Silver LORGNETTE OPERA GLASSES Art Nouveau Victorian Antique" is in sale since Sunday, November 19, 2017. This item is in the category "Jewelry & Watches\Vintage & Antique Jewelry\Fine\Art Nouveau/Art Deco 1895-1935\Other Fine Jewelry 1895-1935". The seller is "emery_mc" and is located in Owens Cross Roads, Alabama.